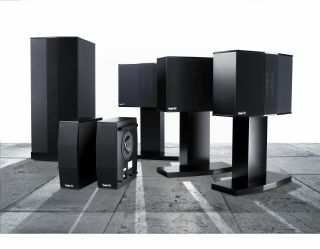 Teufel, Germany's premier online speaker-system retailer, debuted its speaker kit in the UK market for the first time today in spectacular fashion. The cream of the crop was a THX-certified Teufel System 9 THX Ultra 2. Suitable for the audio consumer that has an air-craft hanger-sized living room (up to 100sqm), the system comprises three M 950 FCR THX Ultra 2 satellite speakers, two M 950 D THX Ultra 2 dipole speakers, and a whopping great fridge-sized M 9500 SW THX Ultra 2 subwoofer. TechRadar was lucky enough to get a demonstration of the kits and it's easy to hear why George Lucas set up THX all those years ago. For ear-bleeding effect, the sub-woofer packs in two 300mm bass drivers and a 1200 watt power amplifier. Teufel is calling this system "the best THX speaker system of all time" and, at its price, it's affordable too. Like all of Teufel's products, the System 9 THX Ultra 2 is only available direct from the company via its website – the UK arm www.teufel.eu launched today – for the princely sum of €3,999 (around £3,100).